Although it may seem like a small thing, the way you begin your morning can have a tremendous impact on how you face the rest of your day. If you’re waking up (after hitting snooze on your alarm clock), and immediately reaching for your phone, you’re throwing yourself into high alert mode right away. Whether it’s because a notification has got you worrying about an upcoming to-do that must get done, or a depressing event in the news feed has caught your eye, by tuning into this nervous energy upon waking, you’re not giving your mind and body the proper nourishment it needs as it comes out of rest. Instead you’re opening yourself up to anxiety, which only worsens as the day goes on. While getting as much sleep as possible is definitely a healthy choice, snoozing until the last second only leads to rushing around, and playing catch-up with the time you lost lying in bed. Because, let’s face it, is it really considered quality sleep when the alarm is buzzing in the background? 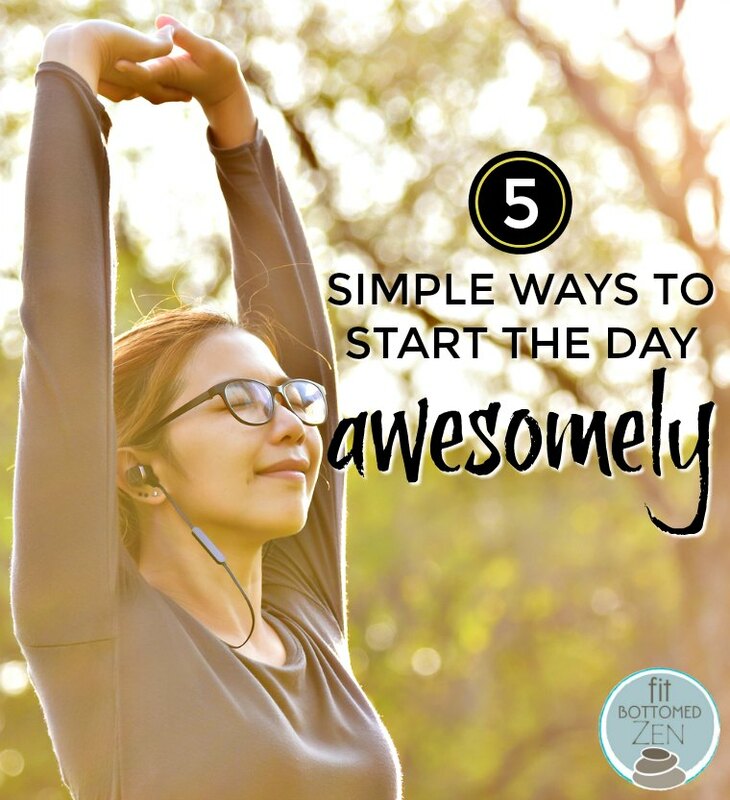 So to help you create a healthy morning routine that sets you up well for the rest of the day, here are five things you can do right away. Did you know that Michelle Obama starts her workout at 4:30 a.m.? She confessed that was easier to do at the White House because of all that added support, but she is not alone when it comes to waking up at the crack of dawn. Many highly successful people like to use those early hours to get ahead. And while 4:30 may be unreasonable for you, waking up 30 minutes before your usual time could be incredibly productive for your well-being. If you’re ready to create a morning routine, then you’re going to need the time to do it. (And squeezing it in during your morning rush won’t suffice!) Once you start carving out this time for yourself, you’ll soon look forward to it each day. No need to quit caffeine (unless you’re ready for the advanced version of the morning routine!). But before you pour your daily java, try boiling some water and squeezing half a lemon into it. The temperature of the water will both soothe your body and stimulate your digestion while the lemon squeeze will activate enzymes to detoxify your liver. Many health cleanses suggest making your first morning sip of hot water and lemon, and I’ve noticed that after a few days like this, my craving for caffeine subsides. The whole purpose of creating a morning routine is to make time to connect to yourself. When you start your day coming from this place of connection, it carries through in the rest of your life. Julia Cameron’s Morning Pages became quite popular for the stream of consciousness style of writing. You’d simply put pen to paper and let the words pour out until they run dry. This is an excellent way to clear your mind and get to the root of what’s happening in your life, both internally and externally. In meditation, you’ll sit in stillness and practice simply being with whatever comes up. While the goal isn’t to stop thinking, you do want to let your thoughts go so you’re not placing any attention or emotion into what you’re thinking. The hope is to allow your thoughts to settle so your mind will quiet down. While we all can’t be like Michelle Obama, if we’ve carved out the time in the morning, we can include some form of movement into the routine. Whether it’s 10 minutes of stretch or 30 minutes of streaming yoga, by getting the body to move early in the day, you get the blood flowing, the endorphins going and a boost in your energy. A nice meal is the perfect finish to your morning routine. Not only does it kick your metabolism into high gear, it provides the nourishment it needs after coming out of fasting (sleep) mode. When choosing what to eat, opt for foods such as avocado toast with its high dose of healthy fats and energy-producing carbs. Smoothies are also a healthy choice, but rather than go all fruit, which can get high in sugar, add in some veggies for balance. (Kale goes really well with banana and pineapple!) The goal is to sate your hunger and raise your energy. Once you start doing these things daily, you’ll start your day from a place of connection, which will carry through into the rest of your life.